At this session Nigel Green will discuss how old Enterprise Architecture is becoming Evolutionary Architecture. First, he will recap, & then continue the story he first told to the HKCS EA SIG in July 2016. This is the story of how a major European retailer is doing their digital transformation and the tangible business benefits of their cloud- enabled approach. This will cover both the business and technology architecture implications, and will include how a traditional business can benefit from the design patterns, and technologies adopted by the “born digitals” (e.g. Netflix, Google, and Amazon). Finally, Nigel will introduce a set of easy-to-adopt tools & techniques that can help evolve towards the Digital Transformation. These tools have been branded “The Just Enough Architecture” toolset by his colleagues in the U.K. He’ll explain how he uses these tools every day; He helps both, traditional firms and start-ups, adopt the ways of the Digital-natives. Enterprise architecture (EA) is recognized as a discipline that translates business strategy into implementation of changes in an organization with support of information technology (IT). Many organizations have started to develop their EA capabilities in hope of more effectively utilizing IT resources to deliver business values. Different IT standards organizations have developed various EA frameworks. However, many enterprise architects and IT practitioners think that these frameworks are too abstract to follow, or the added business values cannot justify the EA implementation overheads. Therefore, real-world practices and experience are as important as these EA frameworks in helping enterprise architects create business values from EA. In this seminar, several experienced IT architecture leaders in major organizations will discuss their journeys in developing EA capabilities to reap business benefits. They will cover not only the best practices but also the challenges and lessons learnt. They will also share their vision on the roles of EA in business and IT. Most of all, this event is an invaluable opportunity for us to network with the speakers and other IT architects to exchange knowledge and share experience. In the new digital economy, emerging technologies such as cloud, big data, mobile, digital contents, Internet of Things and smart machines set new challenges for enterprise. At the Business IT Architecture Series (BITAS) Conference 2015, Iasa – an Association for all IT Architects, in collaboration with local partners and communities, bring together international, regional and local industry leaders and practitioners to share best practices and skills required for the success in the new digital enterprise. In this annual regional conference across Hong Kong, Indonesia, Malaysia and Singapore, we will explore the latest digital business trends, how to build and sustain a business-driven Enterprise Architecture culture, and how to develop and optimise business capabilities for successful enterprise transformation. – Seat is subject to availability and is reserved on a first-come-first-served basis. – ATD Solution reserves the right to change terms and conditions without prior notice. In case of dispute, the decision of ATD Solution shall be final and binding. The following event has been postponed. MEGA International, Singapore in collaboration with Association of Enterprise Architects, Hong Kong (AEA-HK) hosting this half day seminar in HK to share its Return on Experience and Industry Best Practices on how to Simplify, Rationalize and Align your IT Landscape to Deliver Business Strategy. During this event, MEGA will also share few real life examples of organizations leveraging on solutions to address the key challenges faced by their Business & IT Functions to support their transformation initiatives. How leading organizations leveraging on solutions to simply their IT landscape. Please note that admission to this event is Free of Cost and subject to availablity. Please register to block your seat. Contact Reed Taneja at rtaneja@mega.com for any queries. An emerging technology, Big Data analytics provides insights into phenomena and collective behaviours. This seminar explores the roles and values of Big Data in Enterprise Architecture, how to achieve a data driven organization with real life examples. A presentation on DATA.GOV.HK will also be given by OGCIO representative. 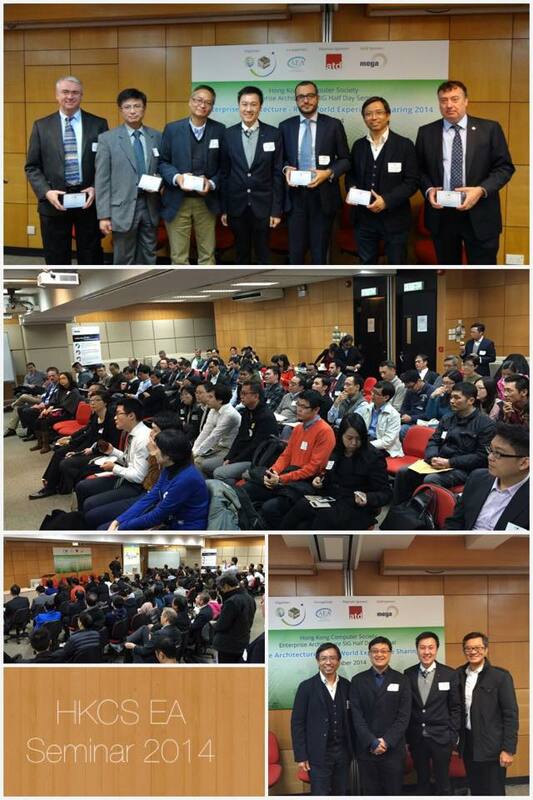 Held on 5th Dec 2014, the EA SIG Half-Day Seminar, the largest EA event in Hong Kong attracted a large audience of over 100 IT managers, architects and practitioners. In this event, themed “Enterprise Architecture: Real-World Experience Sharing 2014”, Enterprise Architecture leaders from renowned organizations shared their business cases on establishing EA to deliver business values to their organization. The event was started with the opening and welcome speech given by the Dave Chen, Chairperson of EA SIG & AEA-HK and Allen Brown, the CEO of Open Group. As the first speaker, Mr. Jake Sims, Head of Technology and Architecture at Cathay Pacific Airways explored how the complexities of human behaviour, the overzealousness of enterprise architects, and the desire to “think big” consistently undermine IT. He also discussed how some of these insights, including the simplicity and minimalism of the VW Bug’s “think small” campaign, are helping to drive the SOA strategy at Cathay Pacific Airways. With more than 20 years of IT experience and of those, 13 years were in the Utility sector, Francis Chui, Application Strategy and Architecture Manager at CLP shared his experience in the Utility industry as well as Enterprise Architecture knowledge. He outlined the benefits of EA and the reason of adopting it in CLP. He also concluded the presentation by 5 key takeaways on EA adoption. After the coffee break, Mr. Chris Forde, VP Enterprise Architecture of Open Group, moderated a panel discussion with all speakers. Mr. KC Fung, Senior Manager, IT of HK Airport Authority and Mr. Nicolas Betbeder-Matibet, Managing Director, Vice President APJC of Mega International also joined the discussion. Panel discussion topic is “0 to 6 Months of an EA Journey – Milestones & Concrete Benefits” in which they have discussed on how to start an EA initiative in their organization and the future evolution of EA. After the panel discussion, Mr. Mark Carr, Chief Architect of HK Jockey Club presented the HKJC’s view on Enterprise Architecture. He has highlighted the importance of the HKJC Enterprise Reference Architecture and its enterprise meta-model. He also outlined how the EA governance take place in HKJC with examples on governance structure and critical design review process, etc. Eric Lui is the Chief IT Strategy and Enterprise Architecture Manager of MTR Corporation Limited overseeing IT strategy development and implementation, business-IT alignment, IS/IT planning and enterprise architecture. He first highlighted the business challenges and impact on IT. He then presented how the Enterprise Architecture helps drive business values and how the Business-IT Engagement model operates in MTR. In this seminar, several experienced IT architecture leaders in major organizations will discuss their journeys in developing EA capabilities and reaping business benefits from EA. They will cover not only the best practices but also the challenges and lessons learnt. They will also share their vision on the roles of EA in business and IT. This event is also an invaluable opportunity for us to network with the speakers and other IT architects to exchange knowledge and share experience. It was our pleasure to have Mr. Damian Lum, Enterprise Architect from HK Jockey Club to speak with us on the Data Governance Experience Sharing on 18 September 2014 (7pm) in the Hong Kong Polytechnic University. Mr. Damian Lum has more that 20 years of Global IT experience, have strong and deep understanding of strategy and enterprise architecture, and have gone through several transformational programs to drive value change. In this speaker session, Damian took a journey on the importance of data. It forms the very existence of organizations. Data needs to be managed in order to harness value, thus allowing organizations to grow, understand customers better, outperform competitors, and being productive. The seminar was well received with over 30 IT architects and managers. We had a fruitful interactive Q&A session where Rico discussed with the audience on how to adopt data governance into real life examples.